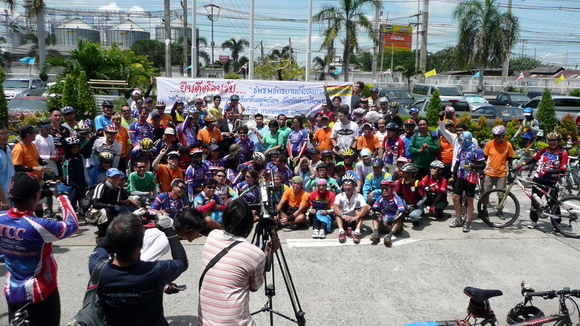 Throughout the year the Thailand Cycling Club conducts many different charity events. 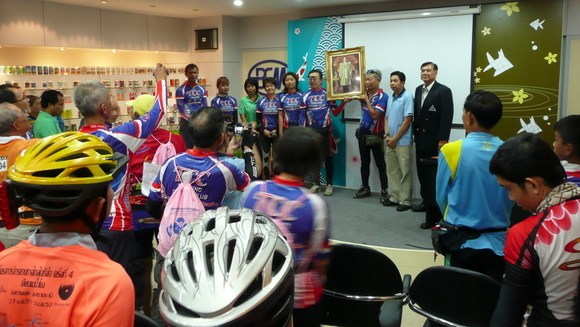 They collect and repair old bicycles, donating them to underprivileged children. They raise money for various causes. And they help recycle pull tabs from aluminum cans into artificial limbs and crutches for those without arms and legs. 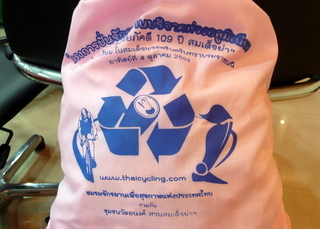 After getting my bike rack fixed and taking my bicycle in for a much-needed service, I was ready to accept my friend Poom’s invitation to join TCC on this annual trek to bring the hundreds of thousands of pull tabs they’ve collected up to BCM – Bangkok Can Manufacturing – the largest maker of aluminum cans in the kingdom and one of the main drivers of the “pull tabs to limbs” charity. The meeting point was Suan Rot Fai (Railway Park), built on the old executive golf course for the State Railways of Thailand. There were about 150 riders. 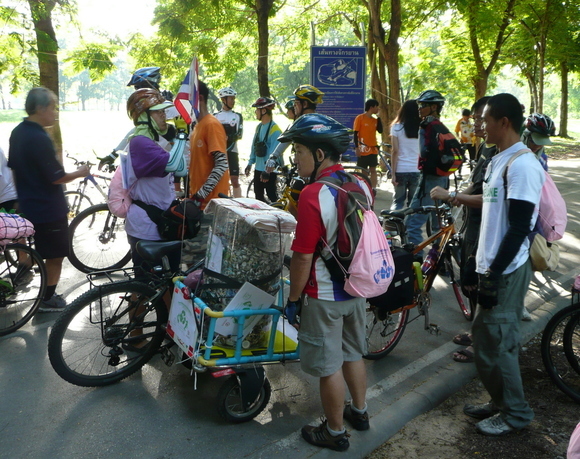 In addition to each of us carrying a pink back pack full of tabs, many riders were carting additional tabs using any means necessary, including this cart fashioned from PVC pipe. 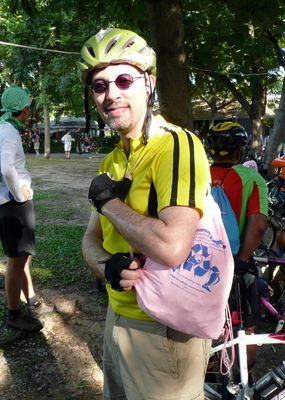 Me with my sporty pink back pack. Notice that I’ve decided, despite the political unrest pitting the Yellow Shirts (royalists) against the Red Shirts (republicans), to go ahead and wear my yellow jersey this morning. Hope I don’t get beaten up! We set off from the park just after the national anthem was played at 8 am, as it is in public places all over the country. 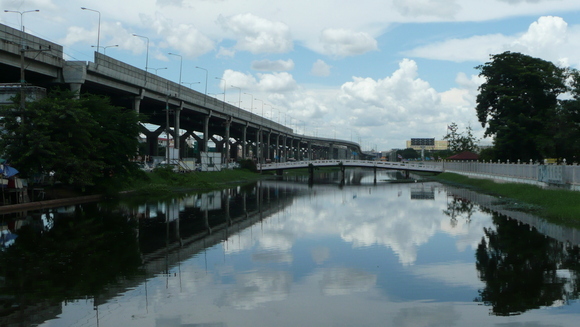 The route north took us past the old airport, Don Meuang, along a wide road that had light traffic and, unfortunately, not much shade. On the 30-km route in the morning, the weather was still relatively cool and a little breezy, so the lack of shade wasn’t much of a problem. 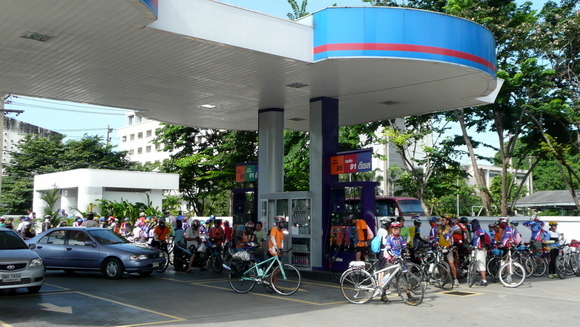 Above, we make a stop at a petrol station to use the facilities. 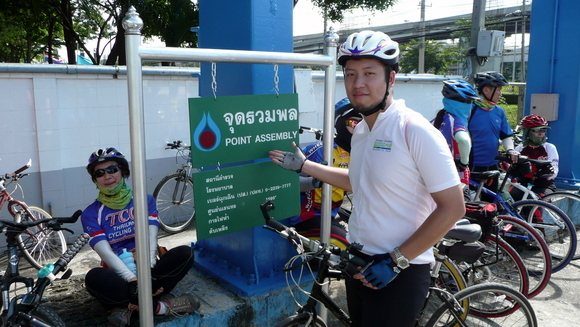 Poom figures we should wait at the “point assembly”. When we arrived at BCM’s factory (which is located across the street from one of the country’s largest indigenous beverage companies, Green Spot), the staff had chests of ice cold beverages for us including plenty of water. 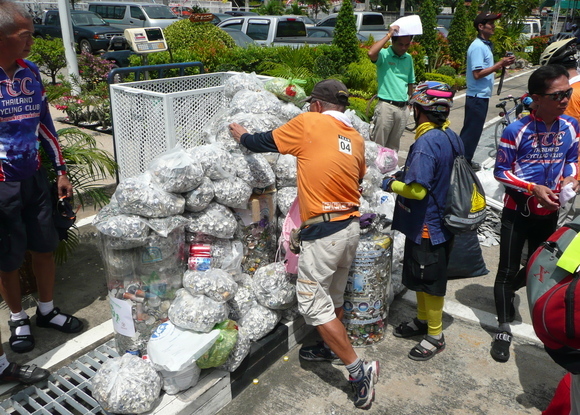 Above, our haul of pull tabs being piled up in the BCM parking lot. A display in their lobby shows the products made from the recycled tabs and, presumably, cans. I’m a little confused. I’ve long believed that the tabs are made from a different metal than the cans themselves. A little research on Snopes.com debunks this myth, explaining that the tabs are also aluminum and that the extra work to remove the tabs and handle them separately is wasted effort. Nonetheless, the charity is being organized by the can manufacturing company, so I would think they must know what they are talking about when it comes to cans. I will continue to set aside my pull tabs while recycling the rest of the can as normal. Instead the conference room with the air con at full blast, we watched a video presentation about BCM and then had some dignitaries speak. An official presentation of the pull tabs was made by some representatives of the TCC. Then it was time for entertainment. After the group sang an a capella version of the royal anthem (that’s HM the King on the portrait they’re holding), a young man who is the recipient of two artificial legs made through this recycling program spoke to us. 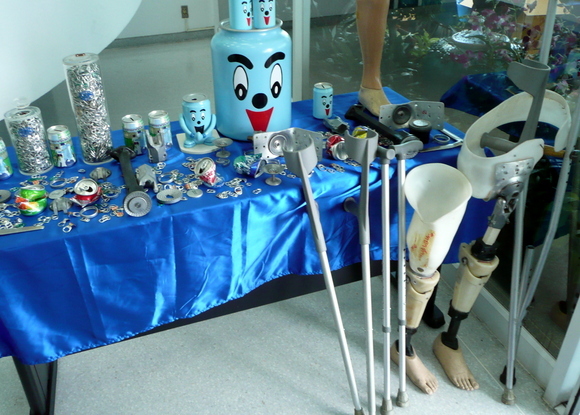 He expressed how much having these artificial limbs had improved his quality of life. Then he put on his guitar and, strapping a pick on his handless left arm, led us through a popular song about having courage. Snippet in the video below. Afterwards, the group posed for pictures. 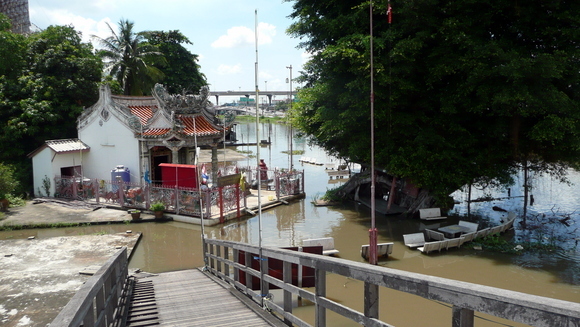 At this point we were all set to roll out for lunch at nearby restaurants along the Rangsit Canal. Unfortunately, we discovered that Poom’s rear tire had a flat. So while the rest of the group road ahead, Poom and I stayed to repair the flat with the help of two other riders. While he was carrying a patch kit, we were fortunate that there are more expert riders who carry larger pumps and better equipment. After lunch we started our route back. Riding through the town of Rangsit, two khatoey on the back of a motor bike called out to me, “Farang lor jang leuy!” as they sped by. Because it is rainy season and we’ve received a lot of precipitation, some of our route along the canal was flooded. It took us a little longer to head home than it did to ride to the plant in the first place. To top it off, I had to take a few breaks on the way back to cool down as the sun was really beating down by that point. Nonetheless, it was a wonderful ride and a very worthwhile cause. Lots of fun! This entry was posted in Uncategorized and tagged Bicycling, Charity, cycling, Recycling by christao408. Bookmark the permalink. Why do some places take tab donations then?!?! I’d always been curious about that… When I was younger, I’d help my grampa recycle stuff, and we never took the tabs off, but at school, they always wanted the tabs. So interesting. Had to laugh though. It is the same all over the world – someone drives past and shouts remarks – and you don’t know whether to take it as a compliment or to be embarrassed. Tabs? On a can? What tabs? It sounds like Tawn needs to go on the rides more so that he can keep an eye on you. *wink, wink*The ride sounds absolutely sublime Chris. You are so lucky to be riding around the countryside.I’m curious as you don’t mention. Did the man who played guitar also participate as a rider? @ElusiveWords – Oh, I just knew you would read that wrong. =P@Wangium – The little pull tab you use to open an aluminum can. @marc11864 – I don’t believe he rode with us. He was there as part of the can manufacturer and the charity. @murisopsis – I took it as both! =D@secade – Someone needs to get to the bottom of this can vs. tab thing. @yang1815 – Dunno. @CurryPuffy – Phoot pasathai gaeng maak! This looks like a really great ride and a lot of fun; it’s things like this that make me wish I was somewhere I could do these kinds of things. @chow@ireallylikefood – You can’t ride in the islands? Hrm… I had always thought that the metal in the tabs was different than the cans too. Who knew? @TheCheshireGrins – Snopes may be wrong on this. It seems like they would have to be somewhat different as aluminum is pretty soft and the tabs have to take a fair amount of pressure. But what do I know? Thanks for joining the trip, Chris! It was fun wasn’t it (apart from the flat he he, thank you for that too!).. From now on I shall carry spares around! @christao408 – Oh we can definitely ride, it’s just not like this. There are still tabs being manufactured?I think they stopped selling canned drinks in Taiwan and China anyway…or at least it’s unpopular enough for me to not notice them. @chow@ireallylikefood – Ah. Do you ride, or is swimming with the sea turtles enough for you? @Wangium – I’m confused, Jason. They don’t have cans of Coca Cola in Taiwan and China? Is it all bottles now? @Poom – Wow, that’s a lot of tabs. Did you get any information about what makes the tabs different from the cans themselves? Maybe I missed something as all the Thai went whizzing by. Well…for one thing…I’ve only noticed plastic bottles.Maybe they still do, but I seldom drink sodas anyway. I’ll keep my eye out for them when I go back.The drinks I have are teas, and they are usually in something like a juice box made out of all paper ot plastic bottles now. @Wangium – Hmm… interesting. Well, I’ll be in Taipei Nov 20-22 so I’ll keep an eye out for them.